Minecraft is set to go in a whole new direction next year. Mojang announced today that its working on Minecraft: Dungeons, a third-person action-adventure in Minecraft’s distinctive, blocky world. Mojang announced the game at Minecon today, providing a few general details about what Minecraft: Dungeons is all about. They’re calling it an action-adventure game, but the company says it’s “inspired by classic dungeon-crawlers.” From the sounds of things, it’ll be a kind of Minecraft take on Diablo, with loot to find and villagers to save. Minecraft: Dungeons has been in development by a small team within Mojang, and the company says its been a “passion project” that inspired by a shared love of classic hack ‘n’ slash RPGs. You’ll be able to take on the dungeons alone, or in teams of up to four players. The trailer shows a team of four adventurers outfitted with swords, a hammer, and magic descending an elevator deep into a mine complex. There are skeleton armies, evil wizards, and – naturally – plenty of lava. Once they arrive at the bottom, the team emerges, only to be confronted by something large and apparently scary, although the trailer doesn’t reveal what kind of monstrosity the adventurers are looking at. 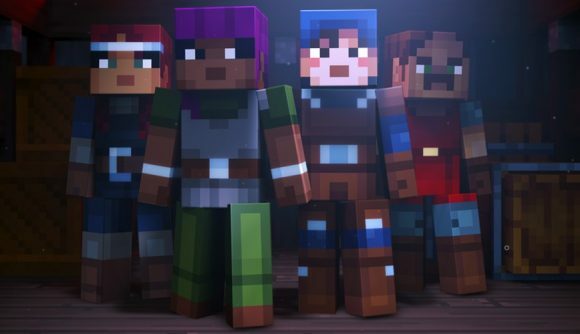 Mojang says Minecraft: Dungeons will launch in 2019 for Windows PC. There’s an official site up already, which we’ll be watching closely for new developments. We’ll let you know when we hear about pricing details or a specific release date.